If there is one book that is an absolute favorite of ours in the house its Golden Domes and Silver Lantern. Over the last couple of years, they learned and picked up new ‘Arabic’ vocabulary (hijab, faynoos, and kufi), colors ( gold and silver) and shapes alhamdulillah. Couple months ago I went as far as putting it away so that they could give other books a chance. It was during that time that I thought about preparing a preschool pack for them which I did but with so much that has happened in the past couple months they didn’t get a chance to actually use it and work through it. 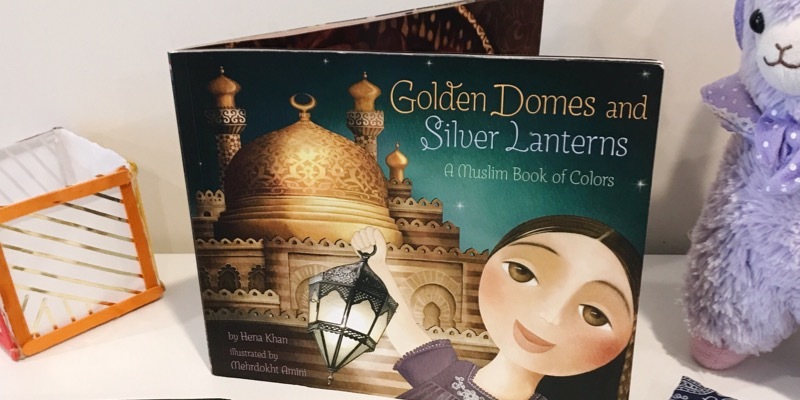 Not that it’s a real issue because Ramadan happens to be a perfect time for this Golden Domes and Silver Lanterns preschool/kindergarten pack. 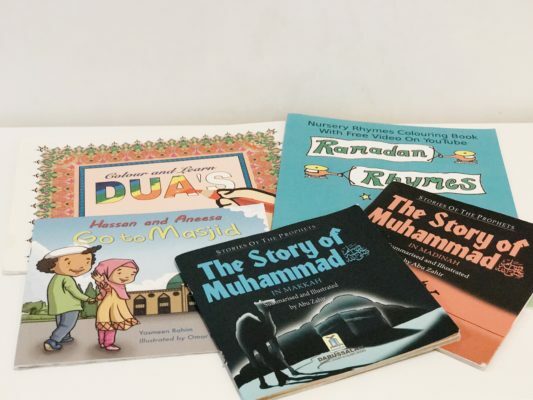 I will be adding these to their Ramadan Basket along with other crafts and games that we can play to make it more of a hands on and fun learning experience. 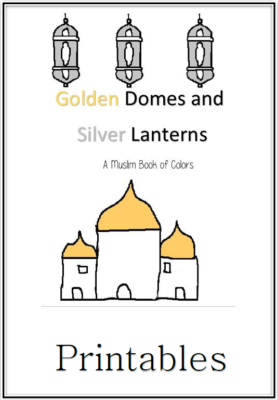 What’s included in the Golden Domes and Silver Lanterns preschool/ Kindergarten pack? This free printable pack features skills for tots, preschoolers, Kindergartners and maybe even older children who need a review! These printables contain 18 pages of different activities such as cutting and pasting, sorting, coloring, graphing as well as tracing letters. Here’s a glimpse of what is included. We will also be using additional books with the preschool pack. Books like the seerah of the Prophet (salalaahu alaihi wasalam) as well as Hassan and Aneesa go the Masjid for story time and coloring pages from Ramadan Rhymes as well as Color and learn dua’s. 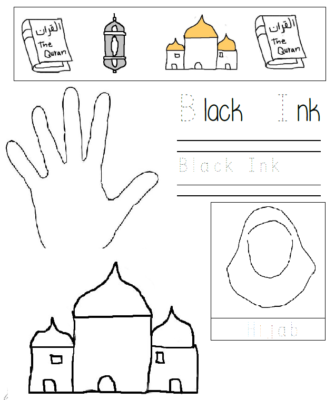 Because these preschool printables will be added to the Ramadan Basket it may take us longer than usual to complete them (which I don’t mind because I only want to change things up every 10 days) as they may just choose to play with their new toys instead. This year will be the first Ramadan we will be trying to attend the taraweeh prayers regularly so I am hoping to teach them the manners/ etiquette of the masjid. I have not come across a book on this but was recommended the Hassan and Aneesa series. I love how reading books like these help younger children understand or grasp certain concepts like how boys go the men’s side and girls go to the woman’s area to pray without ever having to sit down with pen and paper to actually ‘teach’. (Silver) Lantern, all you need are Craft sticks, hot glue gun and tissue paper for this version of a lantern. You can put inside it a battery operated tea light and you are in business. 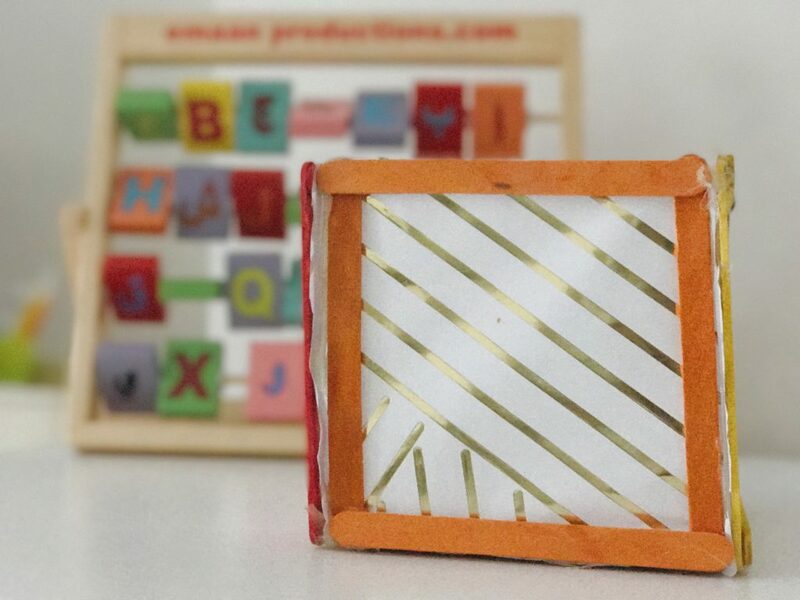 Download a simple box template like this one from style me pretty to turn into a Zakkah box. Have kids build miniature geodesic domes using gumdrops and toothpicks. Let them experiment on their own or direct them to build the model shown here. Most of the items mentioned in the book can be found around the house so what better way to spend your time than finding them. You can either hide some dates, purple doll, blue hijab, and white kufi around the house or play it bingo style by drawing the images on a piece of paper and every time your kiddo finds it they cross it off their list.